"Not all injustices get the attention they deserve. It’s been the fate of the Nuba people to be both attacked mercilessly and ignored by the outside world. This book will introduce readers to a catastrophe that deserves to be widely known and for which a solution is desperately needed. I congratulate the editors, the contributors (including, refreshingly, Sudanese themselves), and the publishers. "—Gerald Caplan, Ph.D. Author of Rwanda: The Preventable Genocide. 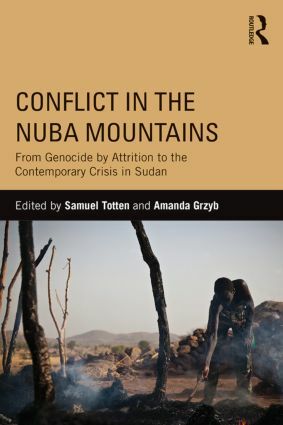 "This is an outstanding work that directs our attention to the situation in the Nuba Mountains, seemingly a permanent resident on lists of neglected crises around the world. Collectively, the contributors ably situate the conflict within its historical context, describing a cycle of political marginalization, rebellion, and genocidal response that continues to this day. "—David Simon, Yale University, USA. Samuel Totten is a scholar of genocide studies at the University of Arkansas, Fayetteville. He is the author and editor of multiple books about genocide, including Genocide by Attrition: The Nuba Mountains, Sudan and Centuries of Genocide: Critical Essays and Eyewitness Accounts. Amanda F. Grzyb is associate professor of Information and Media Studies at Western University (Canada), where her teaching and research focuses on Holocaust and genocide studies, social movements, homelessness, and media and the public interest.